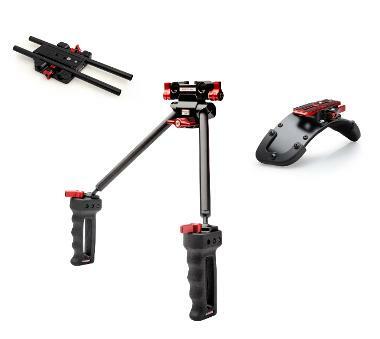 The Zacuto Canon Recoil Kit for C100/C300/C500 features an exceptionally flat baseplate that helps keep the center of gravity low and also sports a curved, padded shoulder pad system that comes with a dovetail plate compatible with Kessler or Really Right Stuff quick release plates. The handgrips are fully articulating and can handle an incredible amount of pressure. The arms quick-release off, which is handy for travel. You can quickly reposition the rods on the baseplate and also position the dovetail plate on sliders to position the shoulder pad for maximum comfort. This kit is designed for use with the Canon C100/C300/C500 in a traditional ENG-style setup. • Compatible with the Canon C100/300/500 series cameras.